Today I will explain the difference between hacker and cracker. There are lots of articles on internet about the difference between hackers and crackers. In those articles, authors or publishers often try to correct the public misconceptions. For many years, media has erroneously associated the hacker word with a cracker. The general public now believes hacker is someone who breaks into computer systems, hacking passwords and websites and misusing information. This conception is absolutely untrue and demoralizes some of our most talented hackers. You can see for yourself the scope of the misconception: the world’s most popular authentic source, WIKIPEDIA, has defined hackers in a incorrect way. There is a very thin line separating hackers and crackers. Just like a coin has two sides, heads and tails, so do computer experts. Some use their techniques and expertise to help the others and secure the systems or networks; some misuse their skills for their own selfish reasons. Hackers: A Hacker is a person who is extremely interested in exploring the things and recondite workings of any computer system or networking system. Most often, hackers are expert programmers. These are also called Ethical Hackers or white hat hackers. The technique they use is called ethical hacking. Ethical Hacking means you think like Hackers. First you hack systems and find the loop holes, and then you try to correct those loop holes. These type of hackers protect the cyberworld from every possible threat and fix potential future security loop holes. These peoples are also called the “GURU’s” of Computer Security. Crackers: Crackers or Black Hat hackers are also called cheaters or simply criminals. They are called criminals because they intend to cause harm to security, stealing very useful data and using it in wrong ways. Phishers, who steal account information and credit card numbers, also fall into this category. 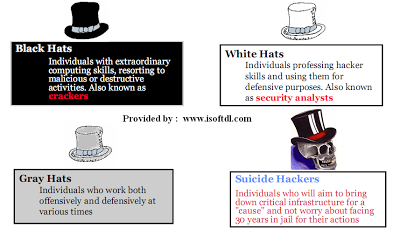 Below are the diagrams which show the basic difference between cracker or black hat hackers and ethical or white hat hackers. I hope this will clear up most of your doubts and questions about hackers and crackers. It’s important to remember that ethical hackers need the ability to think like cracks. In order to effectively defend systems, they have to be prepared for attacks. A white hat hacker identify vulnerabilities and loopholes and fixes them so that that same vulnerability cannot be breached in the future. If you utilize that loophole for misdeeds or pure fun, then you are cracking or black hat hacking. Black hat hackers are often intelligent people, but they are still criminals. For more articles, keep visiting our website or simple subscribe to our post so that you can get this delivered directly to your email.